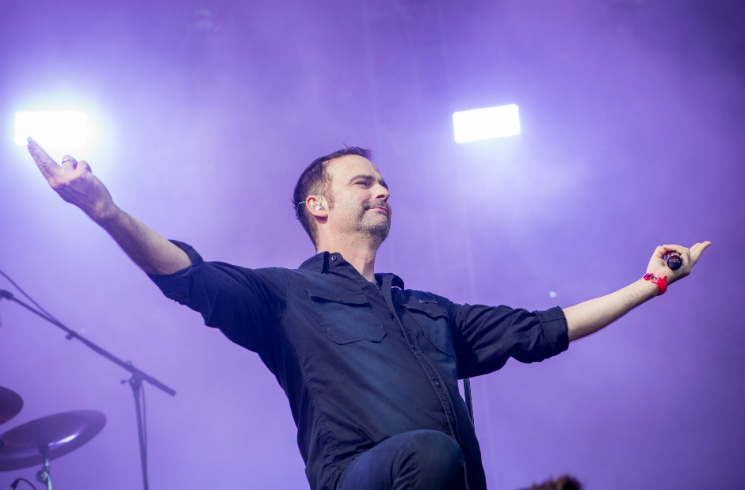 Germany's Blind Guardian, best described as folky power metal, took to the main stage at Heavy Montreal on Sunday (August 7) to regale thousands of fans with tales of legends, prophecies, medieval glory, bards and adventures from the books of J.R.R. Tolkien. As the choral, symphonic opening to "The Ninth Wave" from their latest album played over the PA, the six band members took the stage to join in on the song while fans below them raised their fists into the air and sang along to every word. This was very typical of the entire performance; clean, soaring guitar riffs and reinforcing punches of synthesizer often provided a framework to house catchy and epic choruses that enticed the crowd to join along, and the fans loved every second of it. Pulling from ten albums amassed over almost 30 years, Blind Guardian swooped and careened through decades of work. "The Script for my Requiem" from 1995's Imaginations from the Other Side and "Mirror Mirror" from the 1998 Tolkien concept album Nightfall in Middle-Earth were among the highlights. Frontman Hansi Kürsch was most often perched at the centre front of the stage. When he wasn't clasping his microphone and projecting his powerful trademark vocals, he would often be clapping his hands or waving them like an orchestra conductor. Showing zero sign of slowing down, the vocals and musicianship were absolutely incredible. The highlight of the performance was undoubtedly the wonderful and epic 1992 sing-along romp "The Bard's Song – In the Forest" where the atmosphere must have induced a billion goose bumps in the audience. It was truly a majestic performance that should be on any banger's bucket list.